This fact sheet provides basic information about licorice root—common names, what the science says, potential side effects and cautions, and resources for more information. Most licorice is grown in Greece, Turkey, and Asia. Licorice contains a compound called glycyrrhizin (or glycyrrhizic acid). Licorice has a long history of medicinal use in both Eastern and Western systems of medicine. Today, licorice is used as a folk or traditional remedy for stomach ulcers, bronchitis, and sore throat, as well as infections caused by viruses, such as hepatitis. 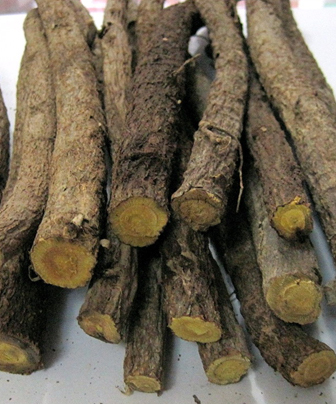 The botanical name of licorice roots is Glycyrrhiza glabra. This licorice roots long sticks Licorice is fully dried with yellow inside and one by one hand selected roots. The glycchirizic /Glycyrrhizic acid content is very high and this Licorice is primarily used in making cough syrups by pharmaceuticals and also used in confectionery preparations and making sweeteners and chocolates by industrialists. The sugar content is almost 50% higher than regular sugar. These liquorice roots are wild grown and organic in the afghan areas of Mazar Sharif, Baglan, Saripul having National Dry Fruit,s office in Quetta,. NDF chooses the best quality Licorice for its elite clientele, sells and maintains a huge stock throughout the year in its 3 warehouses. These liquorice long sticks are also used in tobacco industry and making liquor. Licorice is a miraculous herb with several herbal and other industrial and pharmaceutical uses.